You know what they say about the Brooklyn-based Marvel hero: he does whatever a spider can. And that apparently includes surviving Thanos' universe-obliterating Decimation in Avengers: Infinity War and coming back from the dead in Avengers: Endgame to star in his own standalone sequel, Spider-Man: Far From Home — the first trailer for which Sony just dropped. The Far From Home footage opens on Aunt May (Marisa Tomei) and Spidey himself (Tom Holland) giving what looks like a mini press conference to the people of Brooklyn. She high-fives him and wraps him in a hug, the two celebrating a job well done. Happy Hogan (Jon Favreau) then enters the scene — carrying a giant check for $500,000 for some reason — and gets his flirt on with Aunt May. Always one to crack jokes, Peter shoots the two of them a surprised look and asks, "What just happened?" From there, we get to the set-up of the sequel's story: Peter is preparing for a school trip overseas. He checks his laundry to see if it's fresh-smelling enough to shove into his suitcase, picks up his passport (and delivers a cute little tongue-twister while he's at it), and grabs some travel-sized toothpaste — but Aunt May insists he's still missing something: his suit. While she suggests he take it with him in case trouble arises in international streets, Peter is sure he'll be alright and doesn't really want to focus on saving the world during his time away. As he explains, "I just wanna go on my trip with my friends. Europe doesn't really need a friendly neighborhood Spider-Man." Once he's hopped across the pond, Peter tells his best pal Ned (Jacob Batalon) that he's starting to fall for Michelle "MJ" Jones (Zendaya), a far more meaningful a character than anyone initially realized, and wants to spend as much time with her as possible. But Peter's probably not going to get a chance to make that dream come true, as former S.H.I.E.L.D. director Nick Fury (Samuel L. Jackson) pays him a surprise visit. You see, Nick wants Spider-Man to help carry out a high-stakes mission — and if that means he has to hijack the teen's summer vacation, then so be it. "You've got gifts, Parker. But we have a job to do," Nick says as the trailer shows shots of Spider-Man soaring through the air (and in the Spidey stealth suit, no less) and battling several Elemental villains that take on the form of dirt and water. "Are you going to step up or not?" If you thought the Far From Home trailer came in swinging with all this globe-trotting, web-flinging, Holland-filled goodness, the end will smack you square in the mouth and leave your jaw hanging open for days. In the last few moments of the footage, we watch as Jake Gyllenhaal officially enters Sony's Marvel universe, stepping into frame as Mysterio, an Elementals expert whom Nick recruits to help Peter take them down. When Gyllenhaal was first cast in Far From Home, it was believed that Mysterio would be the central villain, but that's since been discredited, and we're pretty thrilled about it. "You don't want any part of this," Mysterio, whose real name is Quentin Beck, tells Peter before he blasts the Elemental baddie with streams of green smoke. This fresh look at Far From Home features tons of evidence that Peter Parker's life is changing — and in a huge way. He's experiencing what could be his first love, he has the attention of Nick freakin' Fury (who just might have the confidence that Peter could become an Avenger soon), he's in the international spotlight now thanks to the arrival of the Elementals and Mysterio, and he may get a new uncle in Happy Hogan. How Peter handles all the newness will be a hilarious and heartfelt thing for fans to witness. While we know that Holland's Peter Parker will be back into the swing of things (pun absolutely intended) by the time he reaches the summer before his third year of high school, and that his powers are only growing stronger and his ability to understand and control them getting keener, we're still left to wonder how the teen vigilante comes back to life to embark on his Far From Home adventures. At the end of Avengers: Infinity War, Spidey crumbled away to the galactic equivalent of Cheeto dust, leaving everyone to presume the scrappy hero dead. A few weeks ahead of the Far From Home footage drop, fans got their first look at Avengers: Endgame — in a trailer that seemed to hint the world has classified Peter Parker as missing. Marvel Studios president Kevin Feige has already confirmed that Spider-Man: Far From Home takes place after the events of both Infinity War and Endgame and will kick off Phase 4 of the Marvel Cinematic Universe, and Far From Home producer Amy Pascal previously revealed that the film will "start a few minutes after Avengers 4 wraps as a story," but this footage doesn't address either of the Avengers sequels. Nothing in the trailer even gives a wink or a nod or a nudge to the films. 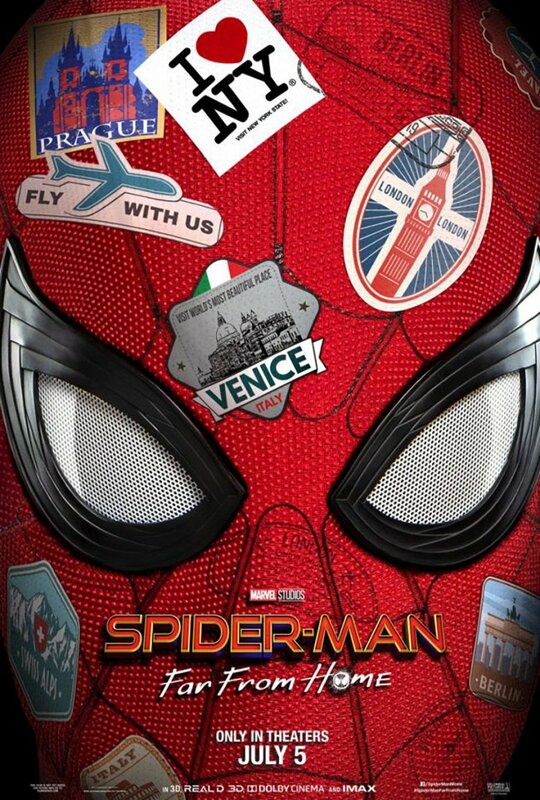 Instead, the Far From Home footage launches viewers right back into the Spider-Man universe without missing a beat, keeping its ties to its predecessor Spider-Man: Homecoming strong and turning its cheek to the heartbreaking fate Peter suffered in Infinity War and whatever madness evidently still awaits him in Endgame. What might be frustrating for fans ("What happens to Peter? Does someone revive him? How do they revive him? Ahh!") is a wise choice on Sony's part. The studio seems to have highlighted sections Marvel's Handbook on Harboring Movie Secrets, and we're all the more antsy for it. Nothing boosts anticipation like the desire to figure out the unknown, eh?